It’s the time of year where we all try our best to keep up with our goals for 2019. If you promised to change your habits, start going to the gym, and eat better, these recipes can help you get off to a good start. Before making any changes, especially to your diet, we do recommend that you consult your doctor. 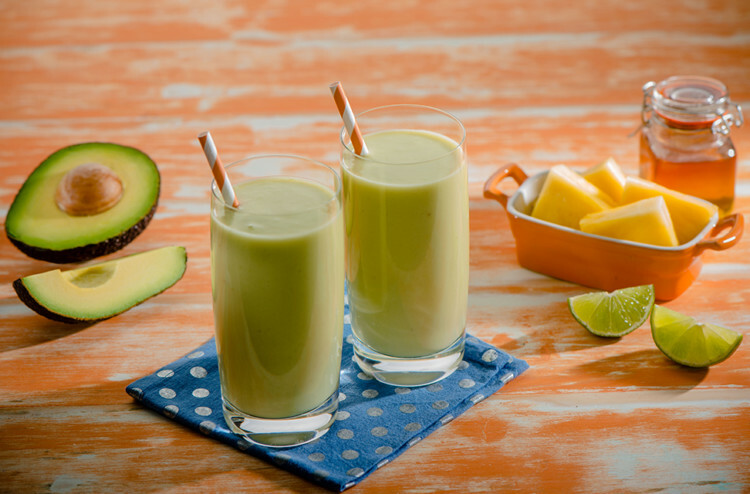 Avocados from Mexico can be a great addition to just about any new diet regiment since they are always available, have healthy fats, 11% of the daily recommended fiber intake, and contribute nearly 20 vitamins and minerals like vitamin K.
With this drink, you will be ready to hit the gym or start the day off in a better way. Place all the ingredients in a blender and mix until even. Then enjoy! Try this delicious, nutritious, and easy to prepare dish for busy days. 1. In a food processor, blend guajillo pepper, lime juice, ground cumin, water, and cilantro. 2. Marinate the chicken breasts with the guajillo mix in a bowl for 20 minutes in the fridge. 3. Add oil to a pan and cook the chicken breasts. Cut in diagonal pieces when cooked. 4. Cut the avocados in half and remove the pulp with a spoon. Cut into half-moon slices. 5. Place the bread in a toaster or oven until golden brown. 6. Spread sour cream and 2 slices of avocado. 7. Place 2 slices of cheese and the chicken. 8. Lastly, place a lettuce leaf, couple of tomato slices, and cover with another piece of bread. Eat and sip your way to meeting your 2019 goals with these deliciously nutritious recipes.